Minneapolis – ABDO (abdopublishing.com), a leading educational publisher, introduces a new imprint to its Magic Wagon illustrated titles division. 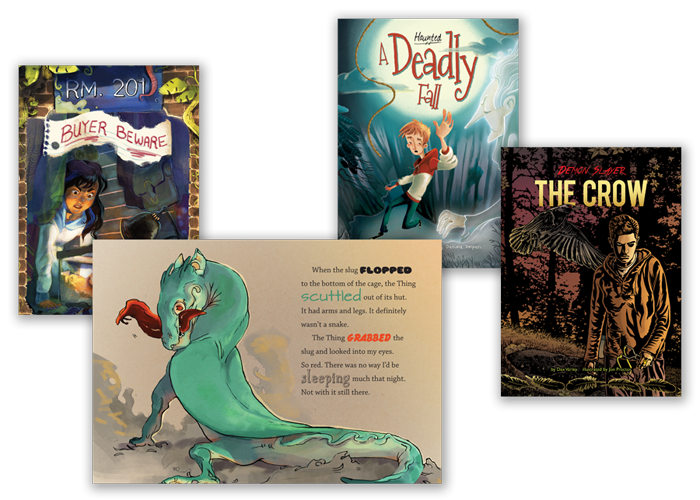 Spellbound features high-interest, low-level (hi-lo) titles written at a second grade reading level but aimed at a middle-grade interest level. Books at this lower reading level are typically written for a very young audience, Gunderson added. Spellbound aims to bridge the gap, giving older readers story lines that would be attractive to a teenage reader, with characters their own age, but at a level that meets their needs. A September 2013 Huffington Post article cites a study conducted by the Department of Education and the National Institute of Literacy that found 21 percent of American adults read at only a fifth grade level, while 19 percent of high school graduates can’t read. Beyond the stories themselves, the compact format of the books aims to appeal to older readers. Font choice and strong full-color illustrations assist the reader. The imprint’s inaugural fall 2016 season features three series: Demon Slayer, Haunted, and Rm. 201. More are planned for the spring and subsequent seasons. Magic Wagon, a division of ABDO, is dedicated to creating diverse and inclusive titles with original illustrations and story lines that inspire learning and imagination.